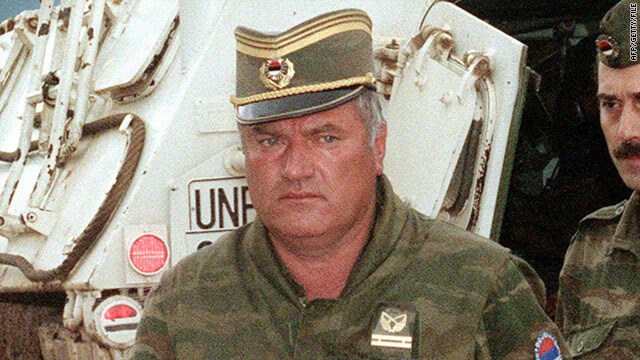 Former Bosnian Serb army commander Ratko Mladic. (CNN) -- Ratko Mladic, the former Bosnian Serb army commander wanted for crimes against humanity, is a notorious name synonymous with the dissolution of Yugoslavia, the Balkan wars of the 1990s and the bloody assaults on Sarajevo and Srebrenica. Born in Kalnovik, Bosnia and Herzegovina, during the height of World War II, the 69-year-old was a career soldier who served in Yugoslavia's military before that nation dissolved in the early 1990s. Mladic then became a leader of Bosnian Serb forces during the brutal conflict in Bosnia, the bloodiest in Europe since the allies fought Germany in the 1940s. He was shaped by the war when his father was killed by Croat Nazis when he was 2 years old. In 1965 he graduated from a military academy and joined the Communist Party in Yugoslavia, an ethnic stew of six states -- Bosnia, Serbia, Macedonia, Slovenia, Croatia, and Montenegro. Working his way up the ranks, Mladic was general of the Yugoslav Federal Forces in Sarajevo in 1992, an entity later transferred to the Bosnian Serb army when war engulfed Bosnia after it declared independence. The state was populated by Muslims, Croats and Serbs, but Serbian forces wanted to take lands where Serbs had been a majority. Mladic is charged with leading a 1992 siege against the city of Sarajevo, an assault that lasted two years and killed thousands. He is also accused of leading a 1995 attack on the Muslim enclave of Srebrenica, where close to 8,000 Muslim men and boys died. In 1995, he was indicted by the United Nations International Criminal Tribunal for the Former Yugoslavia for war crimes and an international arrest warrant was issued a year later. Mladic faces charges of genocide, complicity in genocide, persecutions, extermination and murder, deportation and inhumane acts, unlawfully inflicting terror upon civilians, murder, cruel treatment, attacks on civilians and the taking of hostages. The genocide and complicity in genocide charges involve "the planning, preparation or execution of the intentional partial destruction" of Bosnian Muslims in various towns, including Srebrenica. In detailing its charges against Mladic, the International Criminal Tribunal for the former Yugoslavia cites the "widespread killing, deportation and forcible transfer of non-Serbs in furtherance of the 1992 and 1993 'ethnic cleansing' campaigns in the Bosnian Krajina and in eastern Bosnia; by causing serious bodily or mental harm to Bosnian Muslims, including torture, physical and psychological abuse, sexual violence and beatings." It said Bosnian Muslims were subjected "to conditions of life calculated to bring about their physical destruction, namely through cruel and inhumane treatment, including torture, inhumane living conditions and forced labor." Such alleged crimes occurred many locations, including in Banja Luka and Srebrenica. The court also cites Mladic's alleged role in the Bosnian Serb siege on the city of Sarajevo. Mladic, working with others, planned and ordered "a protracted military campaign in which Bosnian Serb forces under his control, in particular the Sarajevo Romanija Corps, used artillery and mortar shelling and sniping to target civilian areas of Sarajevo, killing and wounding civilians." The U.S. Rewards for Justice program announced a $5 million reward for information leading to Mladic's capture. Over the years, he has eluded authorities as his cohort, the former Bosnia Serb president, Radovan Karadzic, was apprehended and is facing various charges at the court in The Hague.